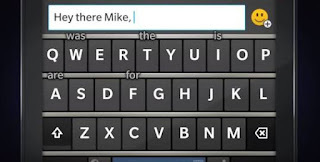 BlackBerry keyboard for android is one of the best keyboard apps you can actuall get for your android smartphone. The app is very simple and easy to use, as it improves your typing speed and as well, it's very customisable. Although, there are many android keyboard apps out there but I got to understand that BlackBerry Keyboard app is featured with the most needed things and not only that but comes with directive guide in order to ease and make your typing go faster. So I recommend you to go for this blackberry keyboard app especially now that it is loaded with more nice features. However, the good news which lies on BlackBerry keyboard app for android users, is that more features has been added to it from the recent update made. So as it stands, the recent keyboard now has the ability to easily separate words it learns from your personal use to the words it learns from your office use. With the app being installed on your. android device, you are now able to easily switch language, which means that you can now set a preferred dedicated key or you can make use of the space key to change language. it's very simple to implement. >> Also has Multiple ways to quickly switch languages: Here you can set a dedicated language key or use the spacebar for it. Where Can I Download The Latest Version Of BlackBerry Keyboard App That Runs on Android Devices?